SMT captures the full breadth of the racing experience, translating hard data into intriguing visualizations with live tracking, virtual effects, storyline graphics, mobile apps and more. SMT captures a plethora of information, including telemetry data (speed, throttle, brakes, gears, and RPM), positioning data and camera data. The data is used to create a real-time digital record that is dispersed to various systems that feed on-air graphics. This data integration is made possible via SMT’s Data Matrix Switchboard (DMX), a data hub that absorbs, collates and distributes real-time data streams such as on-board feeds, time codes, timing and scoring, pit and position and historical statistics. SMT’s tracking technologies use both GPS- and image-based methods. RACEf/x uses patented technology and GPS satellites to track cars under extreme conditions within 2 cm of accuracy. The system tracks 43 cars traveling more than 180 mph, five times per second. ISO Track’s image-based, on-screen graphics interface information such as names ranking and headshots. SMT’s live position data offers broadcasters the ability to add pointers, arrows or bubbles that move in real-time with the cars. This tool gives broadcasters a virtual that encompasses the most important data of the race as it happens. In 1999, SMT pioneered the first constant on-air Race Crawl system for motorsports. Our Race Crawl system has since grown into the most powerful graphics platform in the industry, providing the audience with starting grid lineups, leaderboards, results and points. The Race Crawl system can be customized to support sponsor advertising, animations, program alerts, dynamic imagery, custom graphic formats, logos, headshots or drop-down statistics. The system is fully integrated with SMT’s other products, including live scoring, production tools and stand-alone graphics. SMT’s technology has delivered data-driven graphics, official timing and scoring systems, tracking, Race Crawls, real-time telemetry, and talent prompters to motorsports broadcasts. SMT’s GEM Stat platform absorbs various data feeds to supply live and historical statistics and other race-day information to touchscreens and surface tablets for Commentator Information Systems to aid broadcasters. SMT’s MaxVision offers unique in-venue experiences with scoreboard productions that engage fans with interactive and informative visual content, including Race Crawl, historic and live race statistics, social media integration, trivia games, countdown to green, start-time, and other venue-specific activity. With SMT’s interactive touch screen, GOTO Board, commentators share with the television audience key race information, including on-track weather conditions, pole qualifying results, racing statistics, racing technology, the qualifying racers, images from pit row, the start grid, and biometrics. SMT’s virtual graphics for motorsports races enrich the viewing experience with start and finish lines, virtual sponsor content, and player cards identifying drivers with virtual name-and-headshot graphics. Our sponsored content can be displayed on finish lines, lanes and track walls. SMT’s on-site operations teams are highly skilled at working side-by-side with motorsports production crews to provide SMT’s in-stadium or broadcast solutions for virtually every motorsport, from NASCAR to motocross. SMT’s expert remote technical teams understand the expectations of producers and directors and the challenges that come with working in a live TV environment. Whether working in studios, remote trucks or in-stadium, our teams work well under pressure and maintain self-composure and integrity, easily adapting to changes that are inherent in live productions. With next-generation technology and deep-seated expertise, our teams provide remote installation, on-site camera training, maintenance, and troubleshooting to ensure the highest production value possible. SMT’s Digital Media team, with backgrounds in mobile and console game design and development, has a strong knowledge of web and mobile applications, virtual and augmented reality, live data streaming and live video enhancement. SMT designs and develops the award-winning NASCAR RaceVIEW app, a fully 3D, one-of-a-kind, live data streaming race day companion. NASCAR RaceVIEW is just one example of SMT’s ability to create compelling experiences in the digital space from 2D to 3D, cross-platform, using a variety of code bases. With SMT’s commentator support, on-air talent is instructed on how best to use our off-camera information systems to deliver expert analysis in-race, during replays or postrace. Our systems offer an array of current and historical data, statistical and real-time information, providing on-air talent with an in-depth look into the race strategy each team is implementing. SMT’s Video Production Services team is comprised of Emmy-winning broadcast specialists who use a producer’s eye to help clients produce engaging and compelling content for their distinctive audiences. Motorsports fans at select stadiums are treated to MaxVision, an interactive broadcast displayed on the jumbo, high-definition video screens around the tracks. Produced by our VPS team, the presentation includes the live race crawl, social media, countdowns, historic and live race stats and NASCAR trivia. SMT’s Creative Studio designs and implements graphics insert packages for MaxVisions sponsors, which have included Sprint and Monster Energy. SMT provides ongoing training for employees and clients, both on-site and from our simulated production truck environment at our headquarters in Durham, N.C. Our instructors replicate a remote production environment in which to learn and practice various aspects of live motorsports broadcasts, while our Training and Certification department offers a plethora of training videos, websites and testing for our certification program. SMT instructors design, develop and deliver comprehensive training programs unique to each client. SMT’s dedicated account managers provide expert consultation and support as they advise clients on products and services and act as liaisons between all SMT departments (Operations, Engineering, Creative Studio, Help Desk, Accounting, Sales and Marketing) to ensure client expectations are exceeded. SMT’s fully staffed Help Desk and Data Operations Center support clients at every level of a motorsports production. SMT offers pre-event setup and configuration support, in-race technical support, and is available for post-show attention as needed. Our operations teams are skilled in product set-up procedures, system operating procedures and general hardware/software troubleshooting procedures for resolving normal issues encountered in the field. Working in tandem with our QC group to analyze and troubleshoot engineering, production and operation functions, our expert staff helps clients execute flawless broadcast and events. SMT’s in-house Creative Studio specializes in brand design and motion graphics packages for broadcast, webcast and live events. Our Creative Studio experts design with future technological solutions in mind, such as interactive social media displays and virtual and augmented real-time set designs. Our award-winning staff provides national and international sports and entertainment brands with creative development, analysis and strategy. SMT provides its 1st & Ten system for NFL and university stadiums, offering fans real-time content not available on broadcasts. SMT’s in-stadium production combines in-game stats integrated into SMT-designed graphics packages displayed on stadiums’ massive video boards, as well as in-concourse HD video displays. With SMT’s GOTO Board, broadcasters can deliver compelling analyses with the interactive touch screen and interface system that combines real-time data, graphics and video integration with robust features and tools. Follow Your Favorite NASCAR Driver! 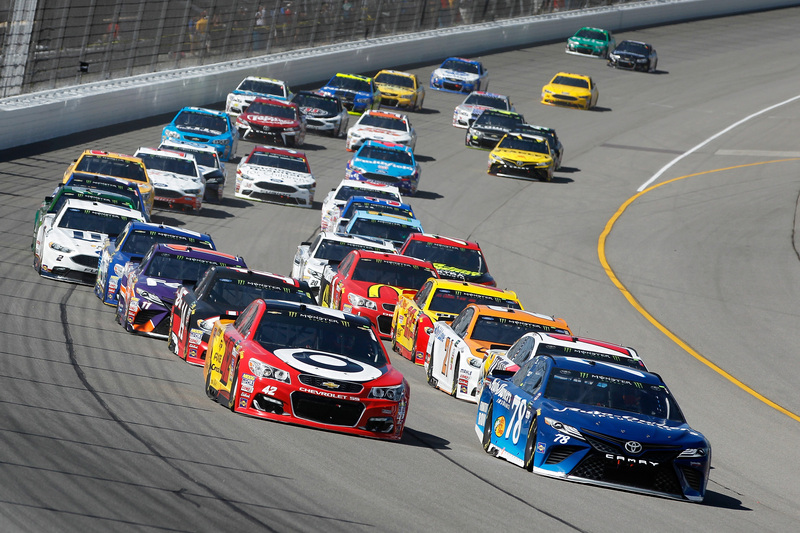 Designed by SMT and powered by SMT’s patented RACEf/x system, NASCAR RaceVIEW puts fans in complete control for every Monster Energy NASCAR Cup Series race! RaceView is the first fully-rendered virtual representation of a major sporting event, with 3D virtual video featuring multiple views and camera angles, live in-car audio for all 40 Cup drivers. RaceVIEW is the most comprehensive Race Day application available, built to enhance the racing experience for motorsport enthusiasts worldwide. NASCAR RaceVIEW is a free mobile app that requires a monthly or seasonal subscription.